My stash report is short this week, but I’m happy with it. 1. I didn’t buy any fabric. 2. I met my goal of completing my 88 9P’s, and have started on my stripe blocks. 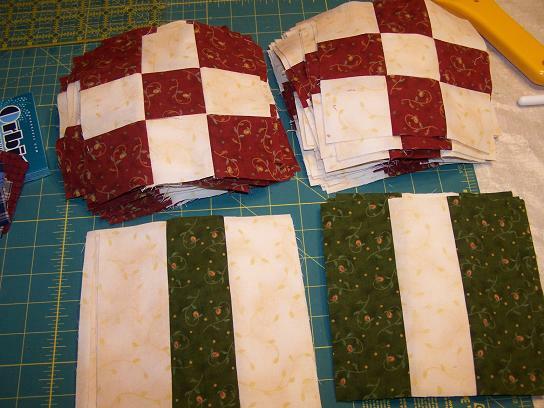 I have to make a total of 64 stripe blocks for each quilt. 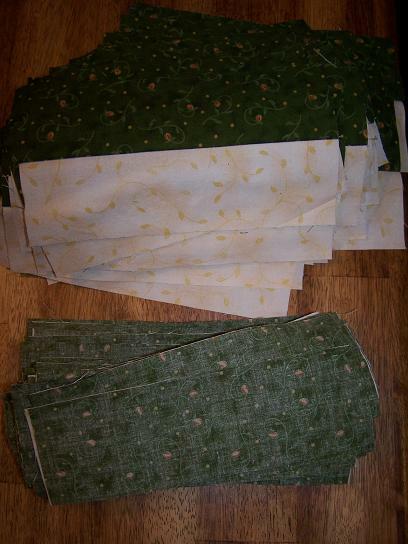 I have 20 done, 108 left to sew & trim. I managed to do five workouts last week, and my weigh-in this morning was 153. So, I lost of total of 1 lb this week. I was hoping for more, but it is what it is. Hope you don’t mind me including my weekly weigh-in in my Sunday report. Tell me if you do! Wow, Randi, you got a lot done on your 9patch and stripes. I’m not as far as you are. Hooray for your weight lose. You are a braver person than I am to post your weight! Way to go Randi! Great results on both fronts! I had a big weight problem in college and once I got serious about losing weight I decided that a pound at a time was still laudible progress. It worked – one pound at a time. Go Randi!! And that quilt is going to be simply gorgeous!! Your quilt is looking fabulous. Just wait until you put backing on your quilt(s) and you will do some serious stashbusting-probably 10 yards each. I am also on a stash reduction plan this year. I wish my weight would go away as fast as my stash. Randi…great job this week on both fronts. How many quilts are you making? Love your fabric choices. Love the quilt!! And …. see that pound of butter (margarine) in your frig? That’s how much came off your body! WTG ! the quilt looks fab! good stash bustin’. Wonderful results on both efforts. A pound a week is the healthy way to go! Love the colors in the new project(s). The fabric is lovely, Randi and congratulations on your weightloss! Keep up the great work!